I'd like to look at the chart of the S&P 500 again this week and see if we can once again take the temperature of the markets. Looking at the chart below we can see that SPX had a very good move on Friday, gapping up at the open and finishing strongly. Moving Averages: As strong as this move was, it failed to clear the 200-day simple moving average. That level will in all likelihood provide some resistance to SPX as it tries to build on this week's gains. Note also that despite Friday's gain the 50-day simple moving average is just starting to cross below the 200-day SMA. This is often considered to be a seriously bearish indication. MACD: Looking at the MACD, however, we are on the verge of a bullish signal but it has not quite made it yet. RSI: In terms of relative strength, the RSI is neither oversold nor overbought but is at least moving in a positive direction on a short-term basis. Resistance: 1490 on the SPX was previously a support level; now that we are below it, it acts as a resistance level. As can be seen, we did not quite reach 1490 on Friday but if we move over that level with good volume we could easily see a continuation to the upside. 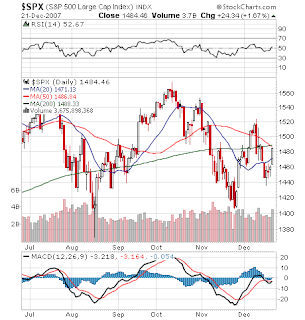 If we fail to get through 1490, indicators like MACD could fail to generate a bullish signal and the bearish crossover of the 50 and 200-day moving averages would be confirmed. TradeRadar Signals: Using SPY as our proxy for the S&P 500, we see it remains in full SELL mode when looking at the daily chart starting from March 2007. Measuring the price action from the high in early October to the low in late November to now, SPY is still generating a weak BUY signal. Friday's upturn, however, at least lends a bit of strength to the positive outlook. Sentiment and News: many of the news items this past week failed to spook the market. It appears that reports of strong consumer spending and the willingness of foreign sovereign wealth funds to invest in America's premier financial firms put investors in a mood to bid up stocks regardless of any other issues. This coming week, we will have few earnings reports but there will be other news that could move financial stocks in particular and the markets in general. There are reports on new home sales coming up. Due on Thursday are durable goods orders for November and the Conference Board's measure of consumer confidence. This weekend we saw news that credit card defaults are on the upswing. Don't forget that credit card debt is also securitized and no doubt sits on the books of numerous banks and hedge funds, just like all those CDOs and RMBSs backed by sub-prime mortgages. We'll see what investors think about that as the week progresses. Also on the down side, the news around bond insurers just seems to get worse and worse and that may also contribute to the market putting the brakes on the latest advance. Finally, we are starting to see SEC investigations and lawsuits looking into to various kinds of malfeasance related to sub-prime. I suspect it is too early for these activities to actually begin to influence investors right now but this could become a theme in 2008. Conclusion: SPX is on the brink of recovering and beginning another bullish leg up. Note that I said it is "on the brink." There are still some hurdles to clear on the charts and with respect to sentiment. If we see positive follow-through during the Christmas week, and we probably will, then the potential bullish signs will be confirmed and we should easily see a return to around the 1520 level if not beyond. Then we will be evaluating whether the January effect is kicking in and we can expect further gains or whether the next downturn is upon us. As always, stay tuned.